Swansea boss Francesco Guidolin says he was close to becoming Italy manager in 2014, but has dismissed speculation he could succeed Antonio Conte. Italy appointed Conte boss in 2014 and he will stand down after Euro 2016. Guidolin said he was unaware he had been touted as a possible successor to Conte, who is tipped to join Chelsea. "These are rumours. At the moment I think only about Swansea to help my team, my club and my players," said Guidolin. "I can say though, two years ago before Conte took over at the national team we were in similar positions to get the job. "In the end Conte got it, but I was very very close. "I am happy if my name is on the list, but I don't know anything about it." Guidolin will return to the touchline for Swansea on Saturday for the first time since being admitted to hospital with a chest infection. He took training for the first time since his return to club duties on Wednesday and confirmed all decisions regarding team selection and substitutions will now be made by him. 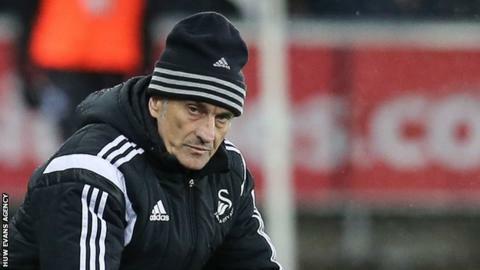 Guidolin has also denied any decisions over his future at the club beyond the end of this season have already been made amid reports suggesting he will leave the Liberty Stadium in the summer. "It is not a problem for me, I have an agreement with my chairman and it is very clear," he added. "The future is not important at the moment, only now. "The chairman called me two months ago and asked me to help the club, the team and the players. "I am doing that. My head and my heart is in this situation. Other things are not important. "I agreed with my chairman that I will work for four months and then we can look at other situations. "But it is important at the moment that we only save Swansea City in the Premier League." Swansea go into Saturday's match against Aston Villa eight points clear of the relegation zone. "But they will once again be without Ghanaian forward Andre Ayew who is still struggling with the ankle injury that forced him to miss last weekend's defeat at Bournemouth."